Princess Eugenie and Jack Brooksbank are starting a new Christmas tradition! The newlyweds, who tied the knot in October, attended their first Christmas Day service together alongside the rest of the royal family on Tuesday. The couple took part in the royal family's annual walk to church with fellow newlyweds Meghan Markle and Prince Harry. Prince William and Kate Middleton were also in attendance. Eugenie's older sister and maid-of-honor, Princess Beatrice, walked alongside Autumn Phillips, the wife of Peter Phillips, the son of Princess Anne and the oldest grandchild of Queen Elizabeth. 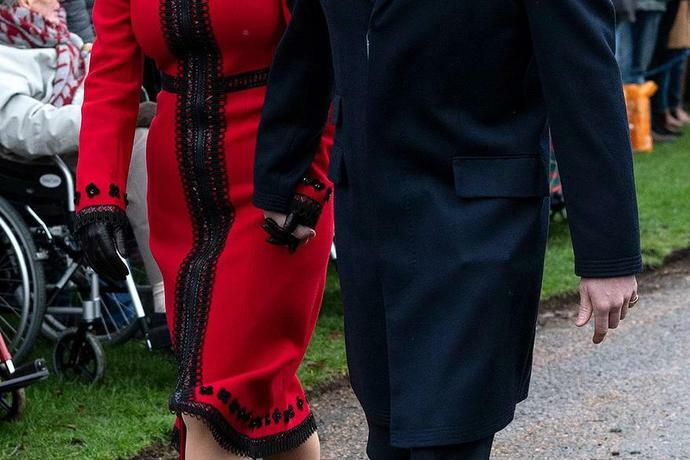 Eugenie, who wore a festive red dress, and Jack held hands as they made their way to the Church of St. Mary Magdalene on the Queen's Sandringham estate in Norfolk. The happy couple have been basking in their post-wedding glow since tying the knot at St. George's Chapel at Windsor Castle on Oct. 12 (the same venue for Meghan and Harry's royal wedding!). Last month, Eugenie shared a stunning black-and-white photo from her wedding day. "#Tbt to THE greatest day of my life," Eugenie captioned the photo, which shows herself and Jack in a sweet embrace. The royal bride also thanked her loved ones and fans with a sweet Instagram post just days following the October wedding. The image showed the couple laughing with their young bridesmaids and page boys in a behind-the-scenes shot by Alex Bramall, the fashion photographer chosen to take their official wedding day portraits. Jack has also been officially welcomed to the family - with his very own page on the website of his new father-in-law, Prince Andrew.